One morning last weekend, Saturday morning to be exact, some unexpected news changed our plans for the day. It was nothing thing earth-shatteringly important, only an errand that would take us away from what we'd planned to do, and where we'd planned to do it. The agenda was tinkered and 20 minutes later, we were out and about. Once arrived at our destination, the errand took only minutes and were left at loose ends. We had gone too far afield to revisit earlier plans, so now what to do? We agreed upon a secondary plan, but then that fell through due to circumstances beyond our control. Back to the car and the drawing board. In the end, all was well, and as of two o'clock in the afternoon, we were walking in the winter sunshine along the bustling main of a nearby village. Fed and full, warm despite the cold - which is surprising, as I'm usually the first to complain of a chill - stretching our legs after lunch at the pub. We strolled to the bookshop, one where the books are piled high on every available surface, including the floor. I got lost a few times, behind student editions of Kim and Anna Karenina, and between rows of Penguin classics dressed in their multi-colour jackets, with that cummerbund of cream around each of their middles. Next to the teashop. A wall of teas in glass jars faces you as you enter, a brass bell above the door merrily announces your entry. Everything inside is tiny and twee in a way that's very Alice in Wonderland, but charmingly so. It's a place I've been before, with Mom most memorably, most enjoyably for their High Tea. The Mad Hatter himself would surely approve of the party the ladies of the shop lay out, a balancing act of treats perched on dainty plates, fragrant teas steeping in individual pots, silver spoons and sugar cubes. Most memorable and most enjoyable of all though, are their scones. A cream scone by the most classic definition, palest white and with only its edge tinged with tan. Buttery, of course, but it is the sweetness of the cream that comes through most clearly. They are dense without heaviness, which I realize makes no sense, but it is the only way I can think to describe what it is like to bite into one of those lovelies. In my humble opinion, it is the simplest thing that is the nicest thing about their scones, and that is their sugary top. Fresh and hot out of the oven, the scones are covered in flurries of granulated sugar. 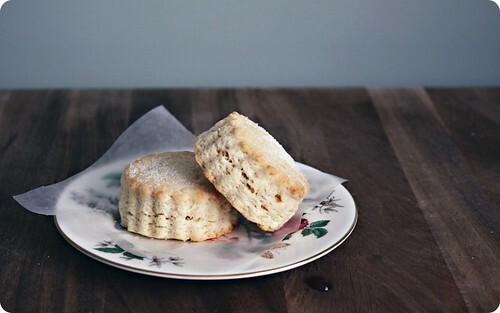 It sticks, but doesn't melt, bestowing each and every scone with their own glistening crown. On Saturday, stuffed as we were, we weren't stopping for scones. And a shame it was. Such the shame that scones were not far from my thoughts for the hours after our departure from the shop. But, all was not lost. Scones, those ethereal scones, were still a possibility. Through my unabashed cross-examination of the staff I have come to know some of the super-extremely-absolutely-top-secret details of their recipe. From there I have read and baked and cut and compared and tasted my way into a home version that visits at least outskirts of the realm of deliciousness in which their scones reside. And, since you've all been so kind and embraced our project with more enthusiasm than we could have hoped for, I would so like to bake you some scones, and set a nice table with a pot of Devon cream and a jar of blackcurrant jam. We'd use my Grandmother's china. Everything the best I could do, because as far as I'm concerned, you're just about the nicest thing, too. The closest I've come to approximating the scones from the tea shop in the village we visited. Since I don't know your schedule, and we've not set a date for our tea, I'll share with you my recipe in the interim. Preheat an oven to 425°F (220°C). Combine the flour, sugar, baking powder and salt in a bowl. Whisk to combine, then chill in the freezer while you proceed. Cut the butter into small dice, then chill it as well. Line a standard baking sheet with parchment paper and lightly flour a work surface. Locate the knife of your choice. Assemble a food processor fitted with the metal blade, or get out a large bowl, a pastry cutter and spatula. Put the dry ingredients into the bowl of the food processor, pulse a few times to lighten. If doing by hand, whisk or fork the flour mixture to aerate. In the processor, remove the cover and evenly distribute the cubed butter over the flour mixture. Replace the cover, and use short, quick pulses to bring the mixture to something that resembles an uneven meal. If by hand, toss the butter into the flour, then use a pastry cutter or two knives to cut the butter into irregular, pea-sized chunks. With the processor, add about half of the heavy cream then pulse a few times. Add three-quarters of what's left, and pulse maybe three times more. Remove the cover and take a look - the dough should be crumbly and light, but if you pick up some and squeeze it in your hand, it should stick together. If it does, stop. If it doesn't, keep adding a few drops of cream, pulsing once or twice, then checking again. Don't worry if you don't use all the cream. If working by hand, it is much the same process, but using a spatula to fold and turn the dough to incorporate the liquid. Again, judicious is best with the cream, you don't want a soggy dough. Turn the dough out onto the floured work surface and knead, gently and lightly, until the dough is fully together; you should still see dots of butter here and there. Pat the dough out into a rough round, and dust with a bit of flour. Divide the dough into three, and shape each ball of dough into a 4" round about 3/4"-1" thick. Cut each round into four wedges, and place on the prepared baking sheet. Bake the scones in the preheated oven until lightly golden at the edges and dry on their cut sides, around 12-15 minutes. The tops should be puffed and they will feel light for their size. Remove from the oven and place on a cooling rack set over another baking sheet. Sprinkle liberally with sugar and cool for at least 5 minutes before serving. • If you are serving the scones with something tart like a lemon curd, I would advise using 1/2 teaspoon salt. However, when paired with a heavier, sweeter accompaniment like devon cream and jam, I'm more generous in my measurement. • Wanting some extra prettiness, I rolled the dough out with a pin and used a floured, fluted cutter to shape them. But, since scones are often finicky if over-handled, I usually use a 4-inch springform to form my them. I dust it with flour, then pat the dough into the pan, gently pushing it even. Pop it out, cut it into four and it's done. The springform gives the scones high, straight sides that cook evenly, and using a mold cuts down the handling and stretching of the dough.